Winter is the coldest season of the year, with places in the higher latitutude experiencing snowfall and ice. The chilly season starts late December. January and February are usually the coldest. The coldest climate year-round in the United States is at Barrow on Alaska's north coast. There the normal daily mean temperature is well below freezing, at 10.4 °F (-12 °C). Places outside of Alaska with freezing temperatures include, among others, Mt. Washington, New Hampshire; Alamosa, Colorado; Ely, Nevada. During winter time, Milwaukee, Wisconsin, has the coldest winter weather among big cities in the continental USA. Places like Chicago, Illinois; Detroit, Michigan; Cleveland, Ohio experience very cold winter days, too. Of the 40 largest cities in continental USA, Milwaukee, Denver and Chicago always show up in the list of coldest cities. How do you keep yourself warm in bed when the temperature is freezing? 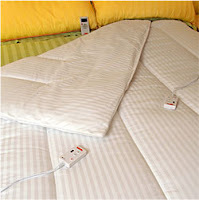 Heavy clothing and beddings help but during these cold winter time, you need more to keep yourself warm and comfortable. Using an electric blanket helps. Due to the combination of heat, electricity and flammable bedding materials used, there have been safety concerns; it is, therefore, advisable to use the safer low voltage types.